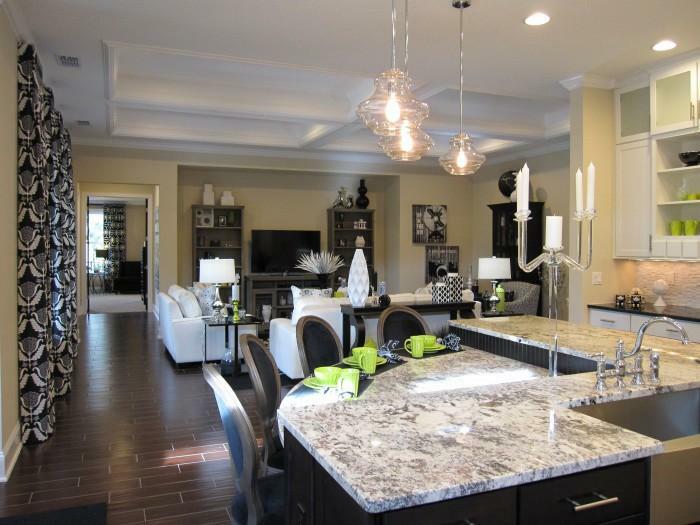 Providence Homes is excited to introduce the Monroe model home at Greenleaf Village in Nocatee. This spectacular model home features 4,198 sq. ft. of living space, including 5 bedrooms, 4.5 baths, a 2-car garage, study, and extended family living area. The spacious foyer opens to all the gathering areas that include the formal dining room, kitchen and café, wine pantry, family room, as well as a covered patio that extends the open feeling. The Monroe offers plenty of relaxing living areas that appeal to a variety of lifestyles. The open family room lends itself to easy conversation with family and friends while cooking up a storm in your spacious executive chef kitchen with butler's pantry, and a pocket office conveniently located off the café. You’ll love the owner’s suite and study, which are down a private hallway. The owner’s suite is spacious and features an ambassador spa bath that is a true oasis. The oversized walk-in closet is everything you’ve dreamed of – with a dressing vanity, built-ins and a private entrance to the laundry room. The mudroom with utility cabinets is a great transition space for the entire family. The optional 2nd floor bonus room with full bath and walk-in closet is the perfect spot for a teen suite or game room. The extended family living area is great for visiting in-laws or extended stay guests, with a kitchenette and sitting room that has its own private entrance. This 100% Energy Star Certified Luxury Home was designed from the ground up as a true model of energy-efficiency – not just a bunch of energy efficient parts. The Monroe includes a new innovative open-cell spray foam insulation that is applied under the roof deck to provide our homeowners with years of quiet enjoyment, consistent comfort, superior energy savings and a greener insulation alternative. The Monroe is Providence Homes’ most energy efficient model home ever built with an incredible 53 HERS Index Score! And the estimated $139.00 per month total electric bill is further proof that a true luxury home can be energy efficient. For more information on the Monroe or any of our other homes, please visit www.ProvidenceHomesInc.com!